Charulatha Mani is an acclaimed singer of Karnatik Music, the Classical music of Southern India. 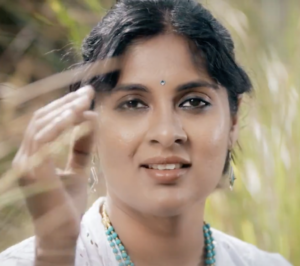 Following a successful Chennai-based career of over two decades, in Karnatik performance, raga research, thematic Isai Payanam curation, and film playback singing, Charulatha Mani took up her Ph.D. at the Queensland Conservatorium Griffith University, Brisbane, Australia, in 2016. Her doctoral work examines the intersections between Karnatik Viruttam and Early Opera (the first decade of the 17th century). Her key areas of research expertise include Karnatik ragas, the semiotics of gesture in music, and the operas of Italian composer Claudio Monteverdi. Charulatha continues to enjoy an international career in performance, recording and collaborating, across traditional and hybrid styles. Since her migration to Australia, she has emerged as a strong intercultural performer with specific interests in embodied singing, intercultural composition and performance, and experimental new works. Her exposure to collaborators and industry partners in Australia has been diverse, ranging from university arts departments, including The Queensland Conservatorium Griffith University and the University of Queensland, to reputed arts organisations, including QPAC, Sounds Across Oceans (Brisbane) and The Taste of India (Victoria), to media including Channel 7 and 4MBS. Her research and artistic stimuli derive from her deep interest in the cultures and sounds that have come to represent the rich diversity that the current Australian arts context embodies. Internationally, she continues explore ways to interweave her musical capabilities and insights into an exciting and dynamically shapeshifting musical scene, across creative conceptualisation, performance, and music education. This entry was posted in Artists, Artists 2016 and tagged Carnatic, International artists, Vocal on January 1, 2019 by Shen.